URBANA, Ill. – A recent study simulated a side-by-side comparison of the yields and costs of producing ethanol using miscanthus, switchgrass, and corn stover. 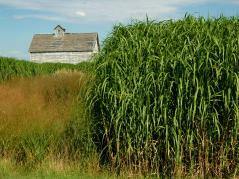 The fast-growing energy grass miscanthus was the clear winner. Models predict that miscanthus will have higher yield and profit, particularly when grown in poor-quality soil. It also outperformed corn stover and switchgrass in its ability to reduce greenhouse gas emissions.